We all know what cruise ships are right? Yes those large floating hotels which are like small cities and have just about everything we’ve ever wanted onboard. Well in this article we’ll look at a few of those ships which have been “placed” in places you never would’ve thought of. Let’s start with a cruise ship that most you don’t know about. It’s been hard to find out many details about it as it’s currently sitting in one of the fastest growing cities in the world, that’s the Chinese city of Chengdu in the south-western province of Sichuan. The city has a population of up to 10 Million people, is known for Pandas and features the world’s largest building (Global Center). Apparently the ship known as the Wanlihao building was put in place to make the city famous for something else rather than only being known for Pandas. It seems that hasn’t worked! 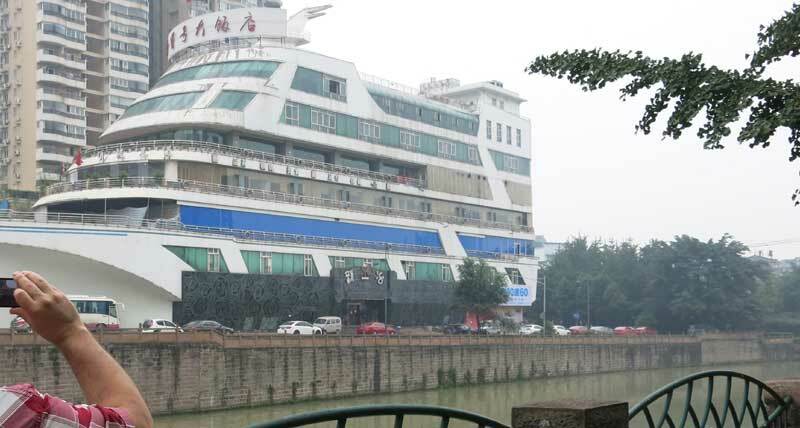 As you can see from the photo the ship has been placed right next to the cities Yangtze river so has perfect views of the growing city along the river. As far as we know the ship was a Chinese restaurant but is now some sort of private club including a bar. Recently it’s been under a refurbishment and has now re-opened to the people of Chengdu. The building has become old and is starting to look its age compared to all the new buildings being built. None the less it still makes for a great photo while driving past or walking around. 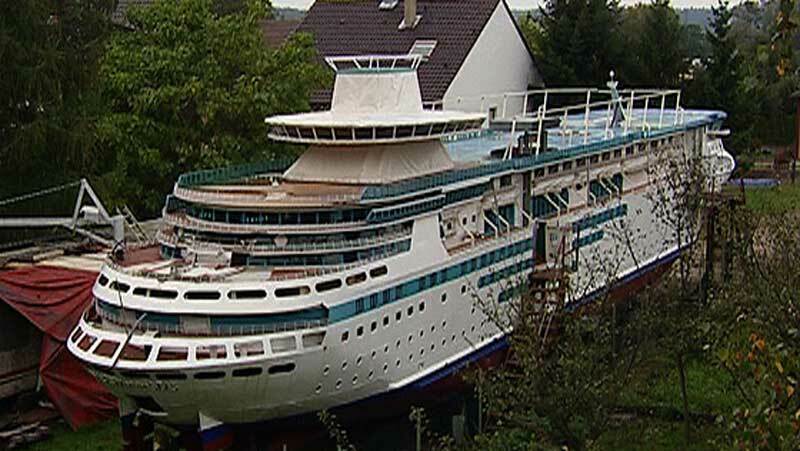 We’ve all heard of Royal Caribbean Majesty of the Seas but how about Mini Majesty of the Seas? Well a French man named François Zanella has built his very own version of the ship which according to Wikipedia is a 1/8th scale model. Zanella built the ship in Morsbach, Moselle, France and it has taken him almost 12 years to complete it which he started in 1993. The ship is actually a canal boat and has sailed in the past. There are many videos on YouTube showing the 90 ton Mini Majesty of the Seas sailing down the canal. The good thing about the boat is that the height can be modified so it can access different canal routes. Inside are full living spaces including bedrooms and a bathroom. Mini Majesty of the Seas even has a mini version of the Majesty of the Seas bridge. When Zanella was constructing the ship he received interior fittings from the real Majesty of the Seas that included a carpet along with various chairs and furniture. He received lots of gifts and help building the mini ship over the years. The shipyard where the original ship was constructed in St Nazaire, France provided some help too. Many other companies helped out in the construction which included all the technical aspects, interiors and exterior of the canal boat. 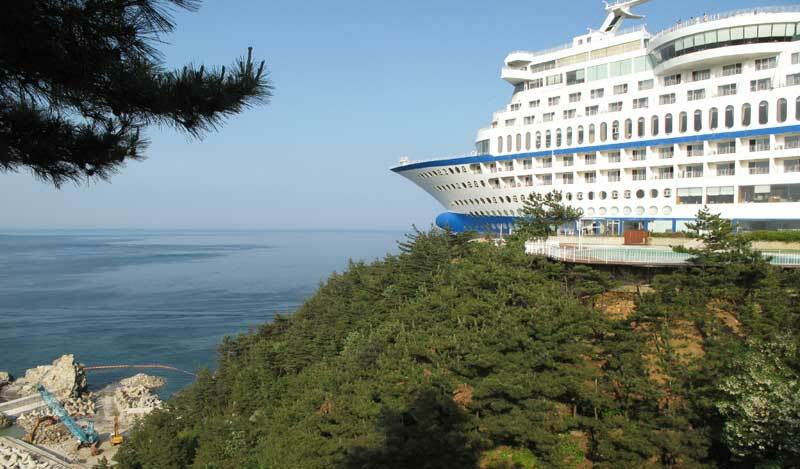 If you’ve ever been to Jeongdongjin on the eastern coast of South Korea you might have noticed something odd, That’s a cruise ship at the end of a cliff overlooking the popular views of the ocean which is also known for having the best sunrise around. 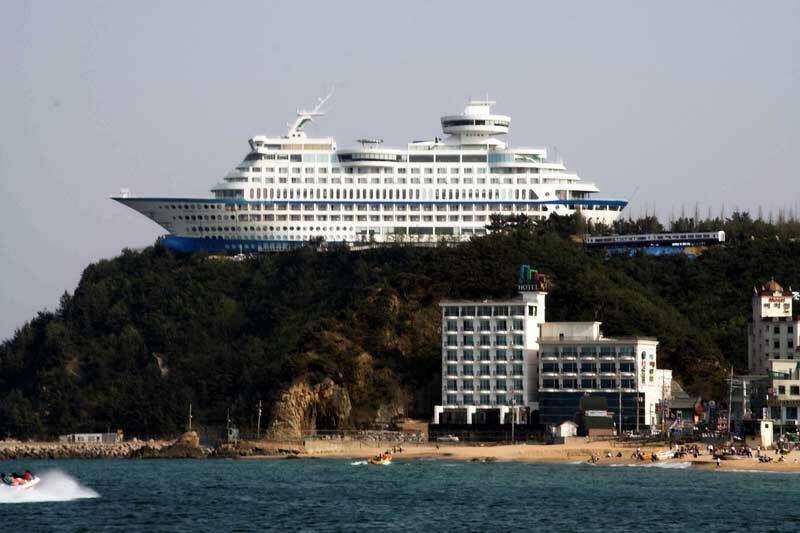 The cruise ship hotel which is known as Sun Cruise Resort & Yacht is the first one of its kind in the world and offers a unique kind of holiday. It opened in 2002 and was built specifically to be a hotel. The ship is 30,000 tons, 165 meters in length and 45 meters in height. The ship has all the typical hotel spaces including dining and swimming pools. The design seems to slightly resemble Royal Caribbean’s trade mark design with its sky lounge situated at the very top. On the side of the ship you’ll see what looks like a section that extends out, this feature can also be found on Princess Cruises Royal class cruise ships and known as the SeaWalk. There’s 211 rooms available for booking so if you’re missing a cruise ship on the ocean this might be the next best thing! It’s always good to see buildings on land being innovative with ship designs but after writing this article I would still rather be cruising on the world’s oceans and sailing to amazing destinations. Let us know what you think in the comments below.